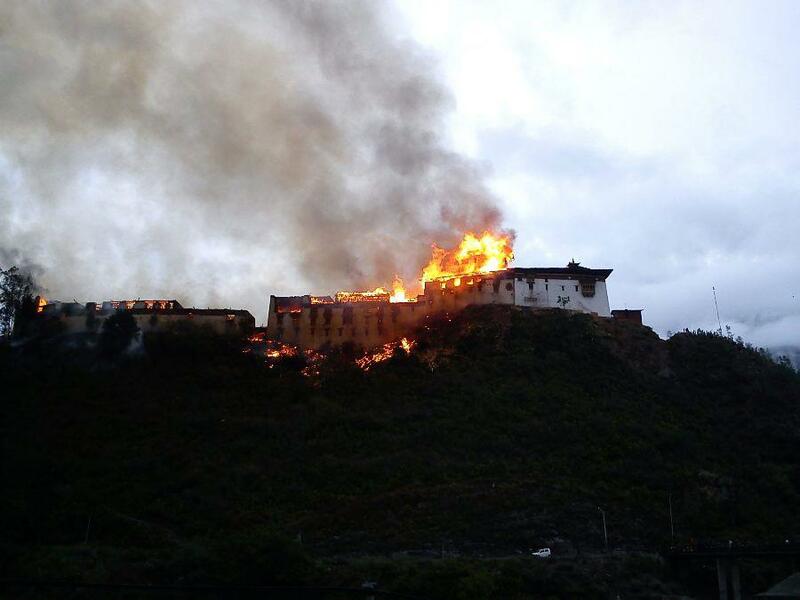 As I wrote before, Wangduephodrang Dzong, one of the oldest heritages in Bhutan, got destroyed by fire. If you haven't read about it, check out my blog link above. 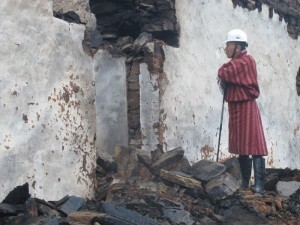 Dorji Wangchuk from Royal Media portraits vividly the disaster when he visited the site 1 day after the fire. It was the worst fire disaster in over sixty years. 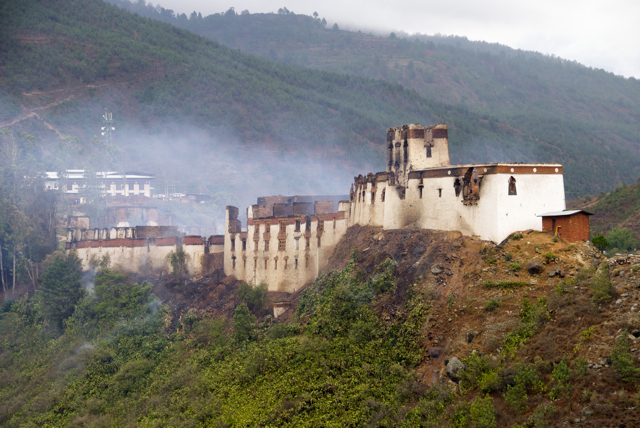 The last incident was the destruction of Drukgyal Dzong in Paro in 1951. Army personnel and fire fighters, on the other hand, were simply too tired. They had been working since the fire broke out the earlier afternoon. “We brought the fire under control around 3am in the morning,” one fire officer told me. “It was dangerous but we had to do that at night or else by morning strong winds would blow again and the fire could spread to the rest of the town.” Yes, the wind. Wangdue was known for that. Hearing those words, I felt a lot better. His Majesty the 5th King and the 4th King rushed to the Dzong when the fire occurred on June 24th. 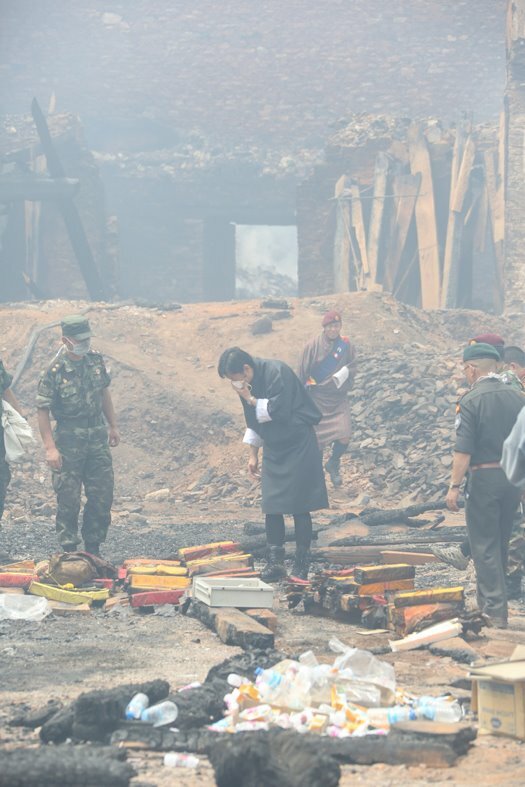 His Majesty inspects recovered sacred scriptures in what remains of the Wangduephodrang Dzong. 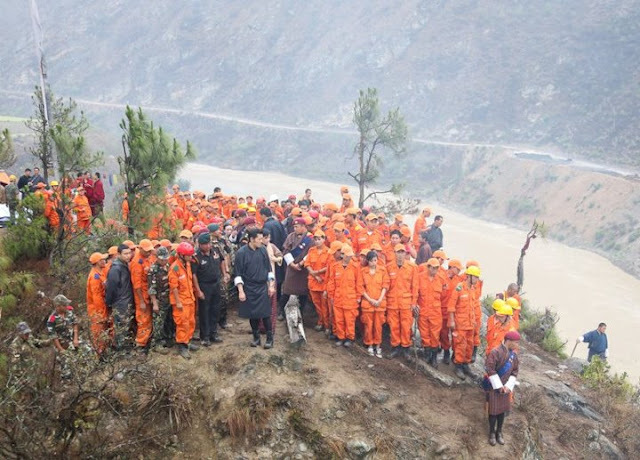 The Royal Bhutan Army (RBA) personnel involved in firefighting efforts at the Wangduephodrang Dzong fire tragedy. 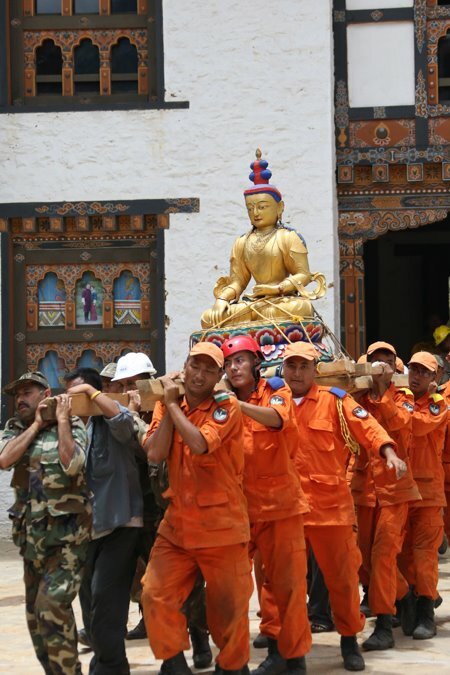 RBA personnel and De-Suups safely transporting the sacred relics from the scene to the Central Monastic Body in Wangduephodrang. His Majesty inspects recovered sacred relics. His Holiness conducts purification rites of the recovered relics. His Majesty was personally involved in recovering the hundreds of sacred artifacts, including many invaluable statues and scriptures. His Majesty with the De-Suups on the steep southern ridge on which Wangduephodrang Dzong was built. About 113 De-Suups were involved in containing the fire on the 24th of June. More De-Suups turned up on the 25th to help in recovering the sacred relics. 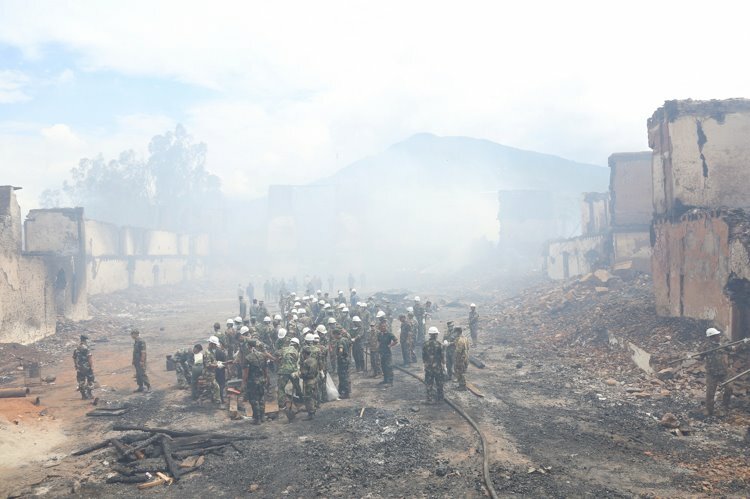 Circumstantial evidences and investigations so far confirmed short circuit as the cause of the fire that razed the dzong. 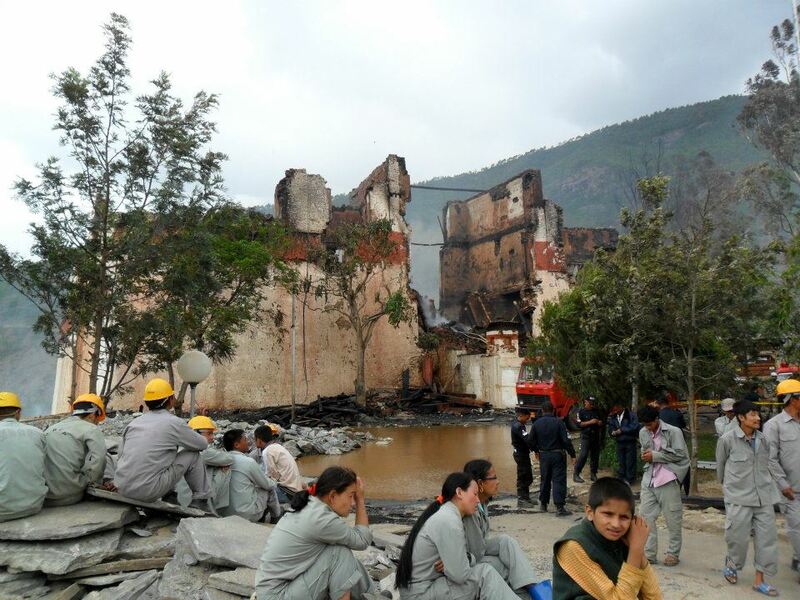 The Prime Minister was out of Bhutan when the fire happened. He sent a message to fellow citizens on the day. All Bhutanese are joined in grief as we try to reconcile with the images of the great Wangdue Phodrang Dzong consumed by flames and billowing smoke. Of all the fires that have reminded us of the impermanence of life and its manifestations, this has pierced our hearts no less painfully than the terrible sense of loss we endured when, Paro Taktsang, the holiest of our shrines was also destroyed by fire. But Taktsang has been fully restored and it is no less sacred or significant. It is in fact, more cherished and revered today because the fire awakened all of us to the fragility and vulnerability of this most precious heritage. It gave to many of us the opportunity to contribute to its full and embellished restoration. In so doing, our nation and its people were blessed with great merit (sonam). Wangdue Phodrang Dzong did not succumb for the first time to the reality and inevitability of destruction. It was destroyed before and it will be destroyed again by forces beyond our control. What we must remember is that it was rebuilt and it always stood as the Dzong that Zhabdrung Ngawang Namgyal built until the day before. We the people of Bhutan have not lost but gained another opportunity to renew and further enrich our proud heritage. 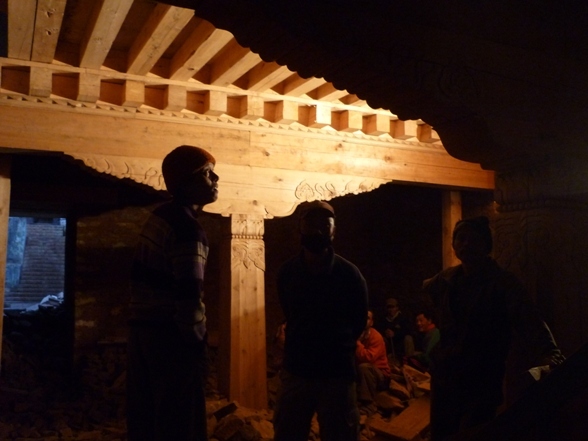 The people of Shar Dhar Gye will have their dzong again. So, like the indomitable will of the Bhutanese people and the fame of Palden Drukpa, Wangdue Dzong will rise again with greater glory and magnificence. By the wisdom of our King, all the relics that were gifted by Zhabdrung himself are intact. The monks that filled the monastery will continue with their prayers and the Dzongkhag will continue to function in the name of the great people of Wangdue Phodrang. We must seize the opportunity to build a stronger, more durable and glorious Dzong in the name of Zhabdrung Ngawang Namgyal and by the will of His Majesty the King. When the Prime Minister came back to Bhutan on June 28th, he rushed to the Dzong. He told to dzongkhag officials and gewog leaders that the new Wangduephodrang dzong would be earthquake and fire resistant. He said the government would also be looking into using less timber, but maintaining its architectural aesthetics, as well as installing fire detectors and sprinklers. 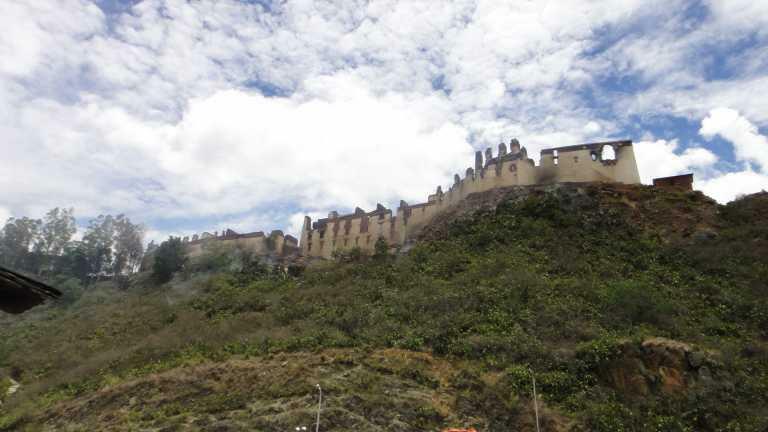 The reconstruction of the Wangdue Dzong will be an expensive affair with the estimated reconstruction cost to be between Nu 700 mn to Nu 1bn according to Director General, Dorji Tshering of the Department of Culture (DoC) under the Ministry of Home and Cultural Affairs (MoHCA). The construction time period according to him may be up to 2016 if not before that. Minjur Dorji, the Home Miniser, said "It is a big loss. Bhutan is a very small, tiny country. To reconstruct the same old structure at this point is going to be very difficult for our internal revenues to support." 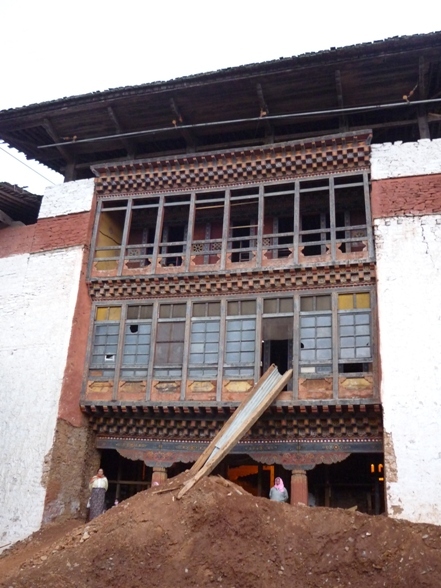 Japan-UN Friendship Associations opened an account in Japan to accept donations to rebuild the dzong. 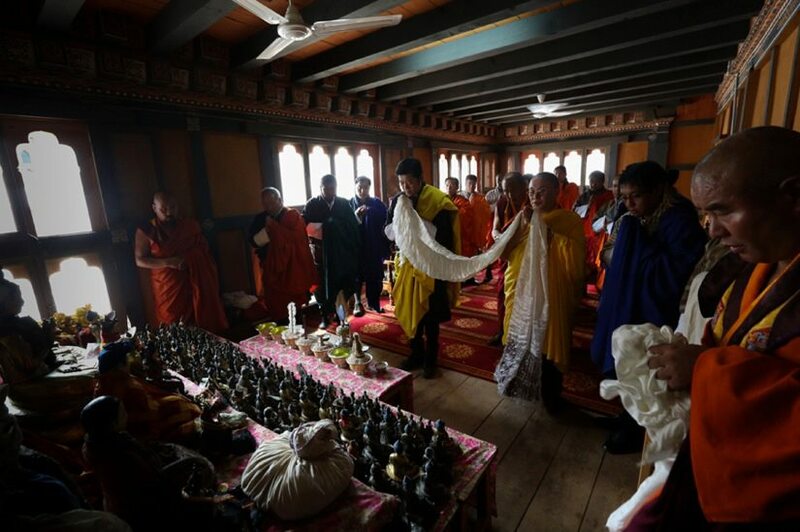 Donations for the Wangdue Phodrang Dzong gathered from Japanese people through the Japan-UN Friendship Associations are 85,56,487 yen (about 61,30,000 Nu) as of July 18. Japanese people show appreciation for the support given by the Bhutanese people during the Tsunami disaster last year. International donations are organized by BBS (Bhutan Broadcasting Service) as well. Pick up your convenient currency from the link above. In Facebook, "Citizens' Initiative to Rebuild Wangduephodrang Dzong" group has been launched by young Bhutanese. Already 31,000 people have joined the group (as of July 11). When Kunihiko Morohashi, one of Japanese, introduced the fund raising initiative by the Japan-UN Friendship Associations, many Bhutanese commented in the facebook to thank Japanese. Passang Dorji: "Thank you very much. We Bhutanese are very proud of our Japanese friends." Tshering Kinden: "Friend in need is friend indeed. Thanks a lot and appreciation to all the Japanese friends. Hats off for you all." Ugyen Wangdi, Member of Parliament: "We would like to thank the people of Japan who are supporting Bhutanese through organization of fund raising activity for the reconstruction of Wangdiphodrang Dzong which was razed by fire. Such solidarity shall immensely strengthen our relationship between the two countries and its people. Once again thank you for the support." Bhutan showed strong support after Japan's earthquake and tsunami last year. Now it is Japan's turn to show our support to Bhutan. A national tragedy hit Bhutan yesterday, June 24th. 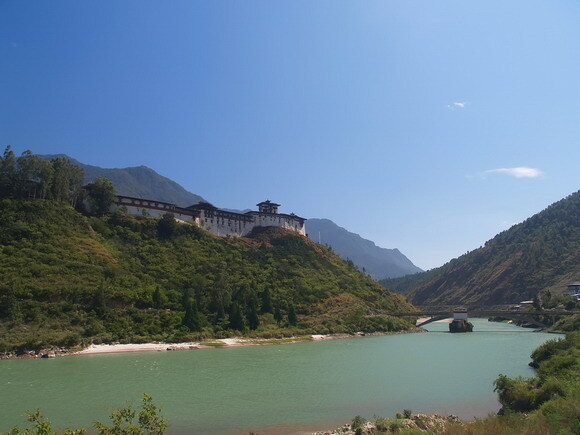 Built in 1638, the dzong is the third oldest dzong in the country after the Semtokha and Punakha dzongs. 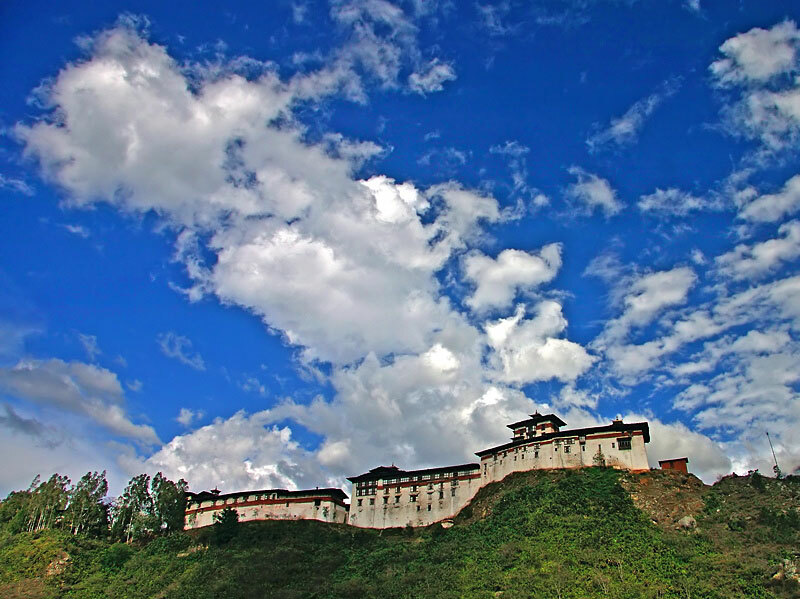 Dzong is a fortress, now used by regional administration and monk body. The fire burnt away 374 years of history in five hours. Except for the safe boxes containing the sacred relics (ngangtens) that were dropped from the roof into the nearby cacti undergrowth, nothing could be saved. The fire is suspected to have started from a short circuit, but it is yet to be confirmed. 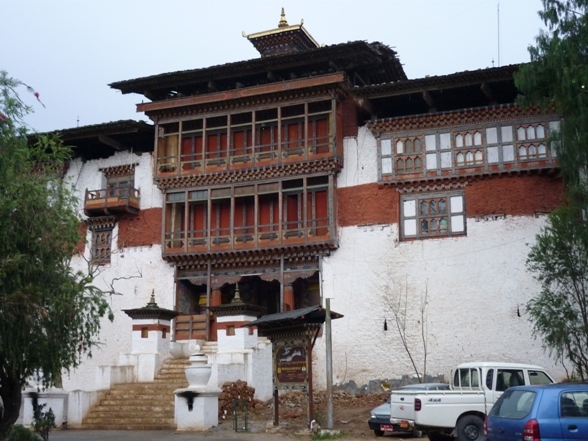 I visited the dzong late March this year. I didn't imagine then that the photos I took would become the last pictures capturing its historical authority. I heard that the dzongs with traditional wooden roof were only here. The renovation was going on when I visited. As of June, 40% of renovation was completed. His Majesty the 5th King and the fourth Druk Gyalpo rushed to the scene following news of the fire, but it seemed the fire was already too strong for them to get closer to the dzong. The dzong was beautiful and glorious on the hill above the river. The government declared the next day as "Day of Mourning," closing all the offices across the country. "As something as Majestic, Mighty & Timeless as the Wangdue Phodrang Dzong turns to ash, we are reminded that impermanence is the only truth." 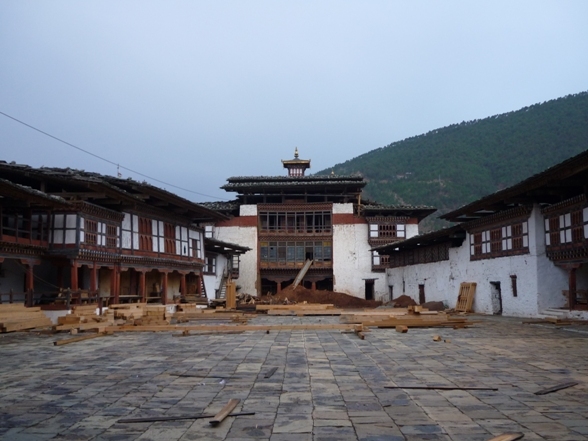 The photo below is the dzong today, 1 day after the fire. It is so painful to compare with the photo above. Another photo from the dzong, shared by my Canadian friend who went there today. In Facebook, "Citizens' Initiative to Rebuild Wangduephodrang Dzong" group has been launched by young Bhutanese. Already 21,000 Bhutanese have joined the group (as of June 27). I will let you know in this blog once the details for donation are decided. All your contributions will be acknowledged with your names in the media by the Gyalpoi Zimpoen Office.